It’s such a struggle to decide where to eat on the weekends. We always end up at the usual suspects, ordering the same food. So when Henry reminded me that we still hadn’t tried Euro Pane Bakery, I welcomed the break from monotony and off we headed to Pasadena. 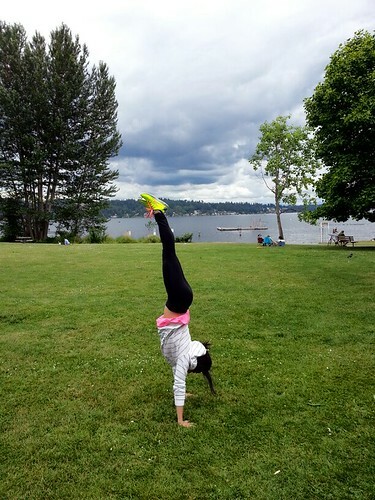 Parking turned out to be a breeze, which is more the exception than the norm. I was pleasantly surprised to see that despite the small size of the restaurant, there were tables available. I guess we came at the right time. After placing our order at the counter, we picked a table next to the storefront window to sit. 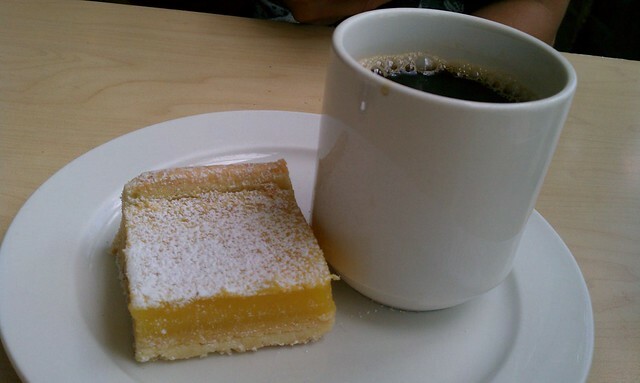 We started off with a cup of coffee and a lemon bar. Not to toot my own horn, but I like my lemon bars better. I thought the lemon filling was way too dense; it was almost as hard as the shortbread cookie crust! Anyway, we didn’t have to wait too long for our food ~ only about 10 minutes or so. And good thing since we were starving. I liked the sandwich! It was chunky, well seasoned and balanced, with just the right amount of mayo/mustard. 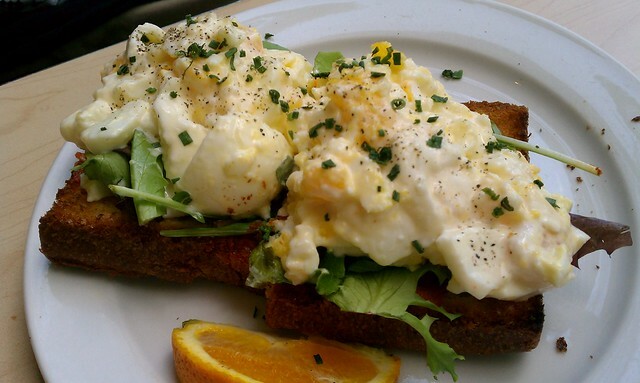 The sun dried tomato pesto spread was a nice touch and added depth of flavor to an otherwise one dimensional egg salad. The only reasonable thing to complain about is the price: $7.50 (w/o tax) is a steep. It’s interesting to note that the cost differential between the Egg Salad and the Salmon Sandwich below is only a $1. 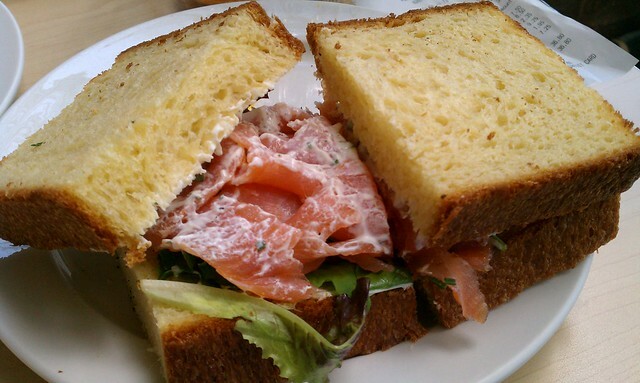 The Salmon Sandwich ain’t no Russ & Daughters bagel and lox, but it was still pretty good. Next time I would definitely choose another bread. In hindsight, brioche was an odd choice to pair with smoked salmon. My bad. Yea, that’s right. I couldn’t leave without some macaroons! 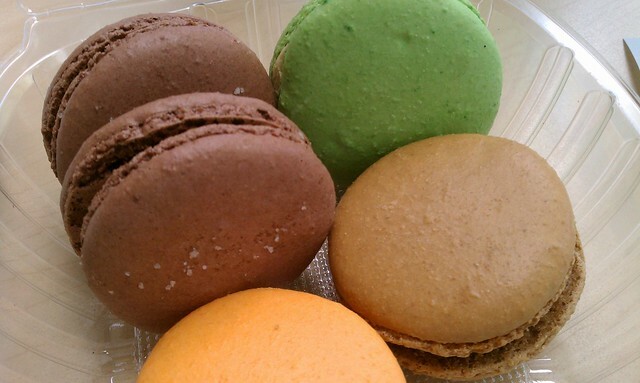 I took home 2 sea salt caramel, 1 pistachio, 1 passion fruit and 1 mocha. My favorites were the passion fruit and mocha because they weren’t overly sweet. The macaroons were a little chewier than I’ve had before, but delicious nonetheless.